Today’s article is devoted to high art, but the highest art – that of course, is painting. 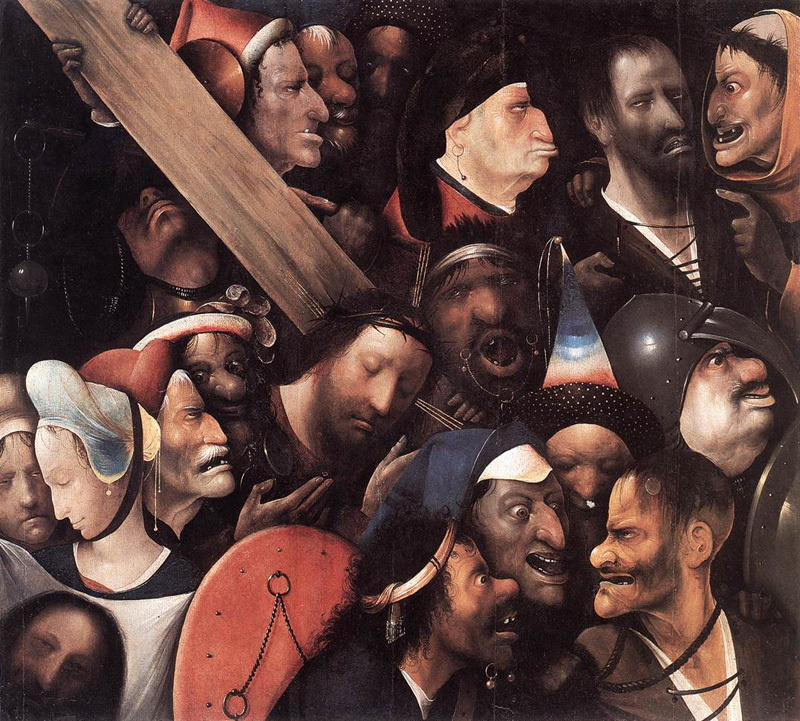 So, your attention is one of my favorite artists – the great and mysterious Hieronymus Bosch, one of the pillars of the Dutch Renaissance. The artist, whose unbridled imagination and genius appeared before the leak origin of such a genre as surrealism. That’s him, Salvador Dali regarded as his teacher and mentor. 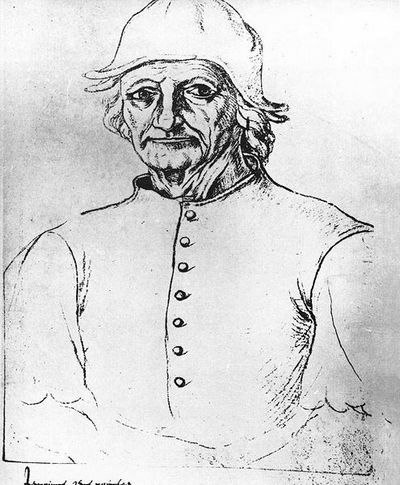 Real name of this man Jerome Van Aken, and Hieronymus Bosch – it’s a pseudonym. Incidentally, the word Bosch in the Dutch language is translated as “wood”, that is, Jerome Wood. Why he took such a nickname, we do not know, we can only fantasize about it. Actually, he and his work is shrouded in a veil of mystery and legend. 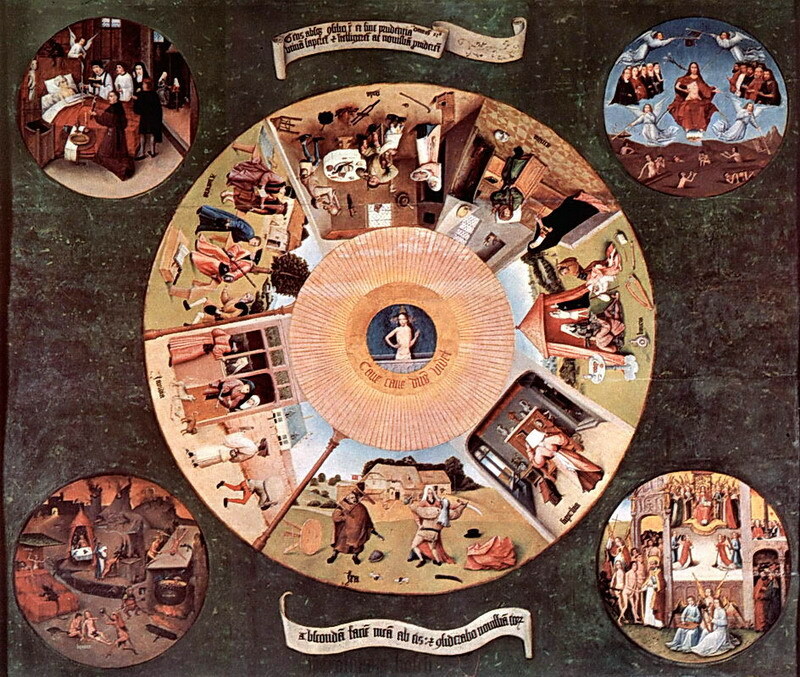 This is one of his early paintings – “The Seven Deadly Sins.” The painting depicts a circle (the circle symbolizing the cycle of our lives) seven deadly sins that can destroy the soul of man: pride, avarice, lust, envy, gluttony, anger, sloth. These sins are shown in the examples of ordinary people who were contemporaries (and maybe even a neighbor), the artist, such as anger, he portrays as a drunken brawl, pride – it’s a girl that admires herself in the mirror, greed is shown as a judge who takes a bribe, and t . etc. (Then try for yourself to see, where the sin is depicted, it is interesting to do) in the center of the picture depicts Jesus and says, “Beware, beware. God sees.” In the corners of paintings depicting scenes of death, heaven, hell and the Day of Judgment. And here’s another his painting, more than the late period of his work, called ” Haystack ” Actually, it triptih, but here it shows the central part. 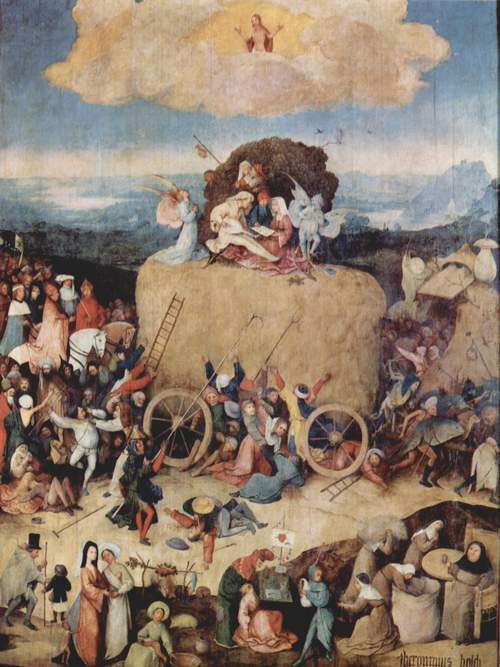 The picture has a symbolic meaning – in the center of the picture a huge possibility of hay and a bunch of people seeking to get into it. To some of them have no luck, these are the losers under the wheels, and soon will be ruthlessly crushed by a giant wagon. Kings on horseback follow him, but a small handful of lucky people casually sitting on top of it. Haystack symbolizes the human glory, success, wealth, wealth in pursuit of that, people have always been willing to put even their lives. If a closer look, we see that in a cart harnessed to all sorts of ugly creatures that actually pull it straight to hell. 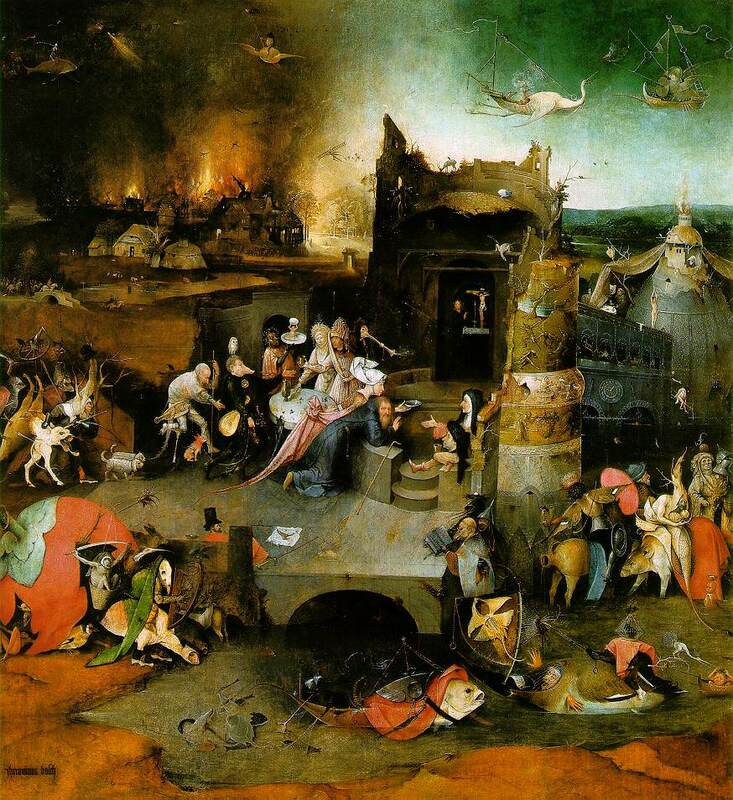 Hell is depicted on the right side of the triptych. The left part shows a plot of the book of Genesis – Adam and Eve’s expulsion from Paradise. Thus, the picture shows our life, human vanity, vacuous pursuit of fame, power, wealth, etc. And at the top of the picture, the cloud rises lonely figure of Jesus, which at first did not even noticeable to the bustle around the cart, but the image of Jesus is the true center of this picture. In this painting, the artist’s imagination has played out in full. The picture is called “The Temptation of St. Anthony.” Anthony (251-356) – the real historical figure, a great Christian saint and ascetic. According to legend, when Anthony retired to the desert, the devil and his legion of demons, have tried repeatedly to lure the holy ascetic, throw him into the abyss of sin, fear and despair, but he steadfastly endured all the attacks of impure forces. The painting depicts Anthony in its very center, his calm face turned to the audience, as if saying, “Do not be afraid,” because all these ugly creatures in the picture, in fact, can not cause any harm to the saint. 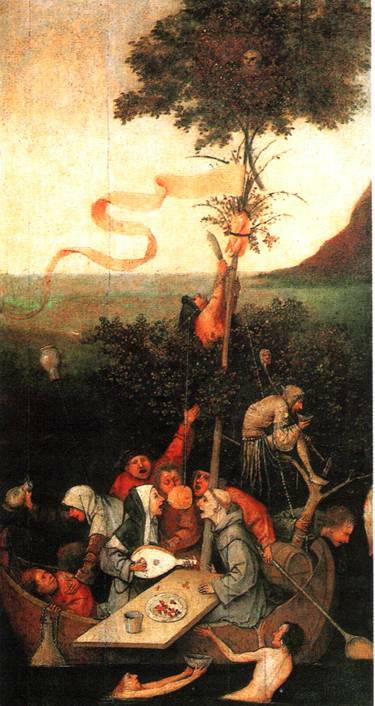 The picture is called – “Ship of Fools,” It is a sharp criticism of the Christian church as it was in the artist’s life, in the foreground a monk and a nun who try to bite the cake, hanging on a string, which on the other hand holds a clown. The picture shows a general decline of morals among the clergy. In broad terms, the picture symbolizes not only the church, but our whole life. The painting “Christ Carrying the Cross” shows the last journey of Jesus Christ on Calvary. Tender and beautiful faces of Jesus and the Holy Veroniki sharp contrast with the evil and ugly faces of all the other characters paintings, which reflect the people’s sins, indifference, cruelty and malice. 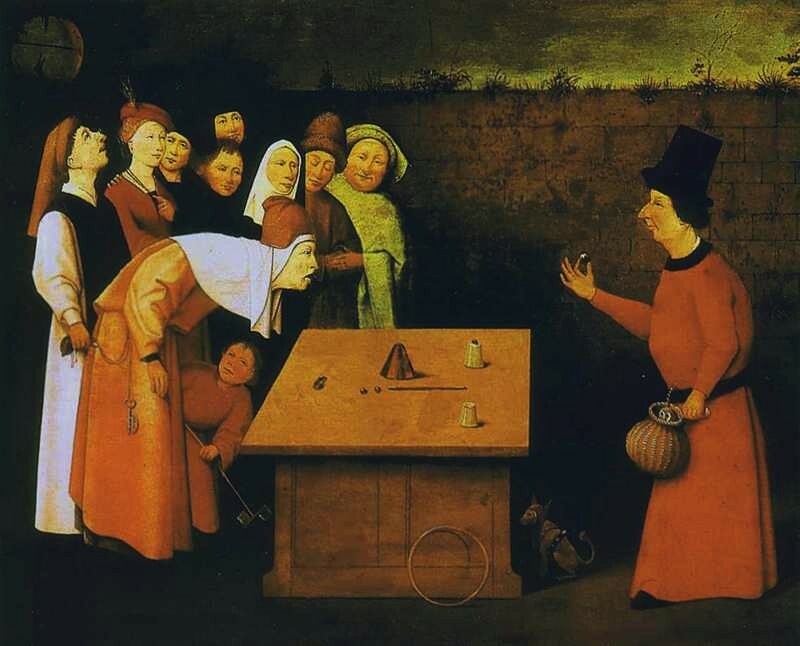 In this painting, titled “Magician” shows that the thieves and liars is one of the oldest professions, and were at all times. 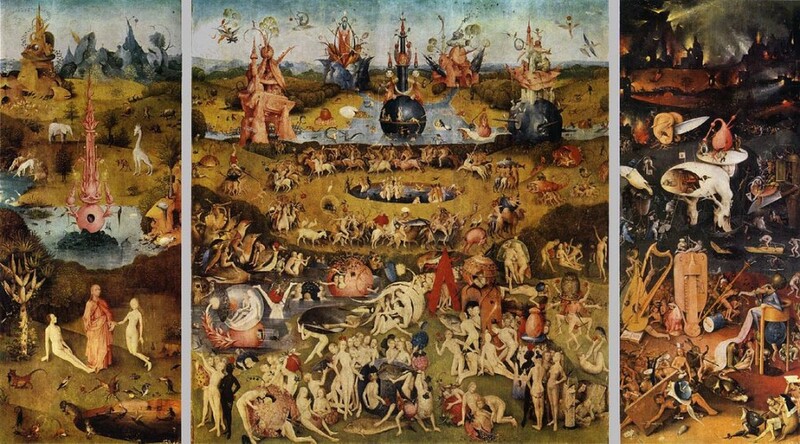 Finally, the most famous and mysterious painting of the artist – the triptych “The Garden of the Divine pleasure.” Bosch has been made by order of Spanish King. The painting depicts a large number of symbols and allegories. The significance of these symbols and allegories of art are still debating. I suggest you just enjoy this wonderful fabric. That’s all.